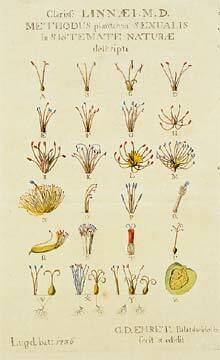 Linnaeus’ sexual system as it was presented by Ehret, in colour, in 1736. Photo: M. Hjalmarsson, Uppsala University Library. This somewhat bold description Linnaeus wrote about plants with nine stamens and one pistil. Those plants were referred to one of the classes in Linnaeus sexual system, the new classification of the plant kingdom. Already as a student Linnaeus gave guided tours in the botanical garden at Uppsala University. As part of the tour he was to present different classification systems, but Linnaeus was not satisfied with the systems of the time. They were based on, for example, the shape of the petals or whether the plant was a tree or a herb. After having read a book about the sexual life of flowers he reached the conclusion that the stamens and pistils must be the most important characters for classifying the plants. Linnaeus worked through the plants and formed a system where the plants were divided into 24 classes. The 24th consisted of the plants without flowers, the cryptogams. The sexual system was first presented in Linnaeus’ famous production Systema Naturae from 1735. It was Linnaeus’ goal to include all plants known from the whole world in his sexual system. The European botanists did not at first accept Linnaeus’ system since it was so totally different from those known to them. Many were also shocked by his comparison with the human sexuality. However, they soon realised how practical it was and the sexual system became a great success. People could easily find out to which class a plant belonged just by counting the stamens. Despite the great response to the sexual system it soon became outdated since it was an artificial system. Ever since the starting point of the evolution theory scientists do their utmost to find a natural system that mirrors the relationship and development of the species.